Pep Guardiola wants referees to protect players after Manchester City's game against Crystal Palace was marred by injuries to Kevin De Bruyne and Gabriel Jesus. 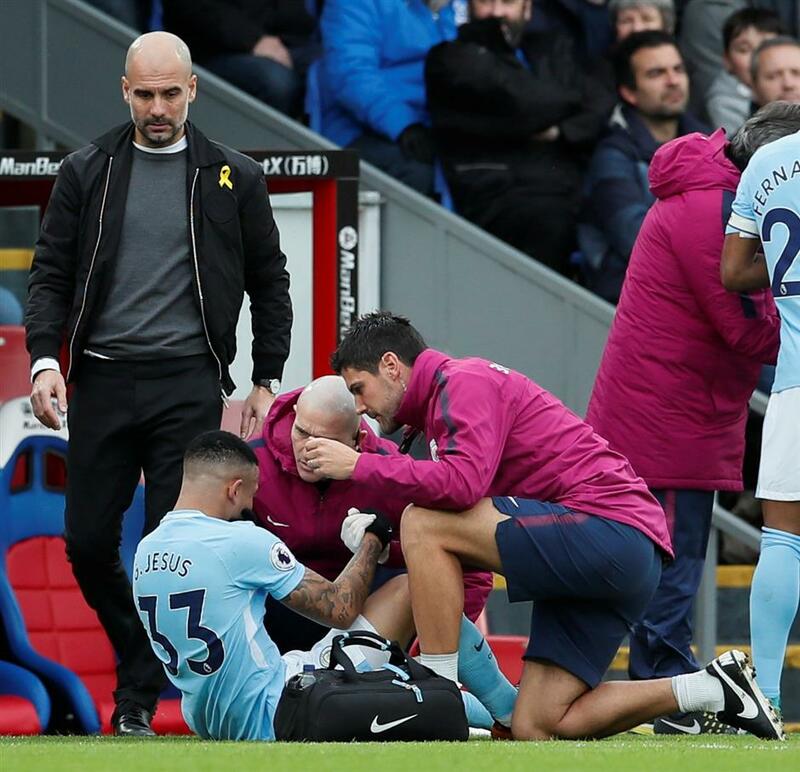 Manchester City manager Pep Guardiola (left) watches as medical staff attend to injured City player Gabriel Jesus during the English Premier League match against Crystal Palace at Selhurst Park on Sunday. Manchester City manager Pep Guardiola has demanded more protection for players after seeing Kevin De Bruyne narrowly avoid serious injury as his side's 18-game winning streak came to an end. De Bruyne was stretchered off after being hacked down by Crystal Palace's Jason Puncheon as City broke in search of a late winner at Selhurst Park on Sunday following Ederson's penalty save from Luka Milivojevic. The Belgium midfielder's injury is not as bad as first feared but Guardiola said he was unlikely to be ready to face Watford at the Etihad on Tuesday. There was worse news about City striker Gabriel Jesus, who hobbled off in the first half with a knee problem that will sideline the Brazilian for at least "one month, maybe two months," Guardiola said. His main concern, though, was the tackle by Puncheon, the latest in a series of challenges the manager believes could have inflicted serious injury on his players in recent games. "I admire the physicality in the Premier League but the referees have to protect the players," said the Catalan. "Not just the best players. All the players. "I haven't spoken to the FA (Football Association) about it. They focus on diving, on these kind of things. I know the contact is allowed here more than any other country but there is a limit." Guardiola said there was no need to change the physical style of English football but he called for a balance. "There is a line where you go above and it is dangerous," he said. "We are lucky with the players in the recent past they are still here. Sometimes because the football is quicker and faster it happens, they don't want to hurt the other. But they can be out for a long time. “We were lucky against Tottenham and against Newcastle. Today we were not lucky," he added. The loss of Jesus could strengthen City's resolve to sign Arsenal forward Alexis Sanchez during the January transfer window, although Guardiola played down the possibility of a move for the Chile international. "He is a player for Arsenal and I think he is going to stay there," said the City boss. "In two days we have another game (and) after that we have meetings. My feeling now is Alexis is an Arsenal player." City is 14 points clear at the top of the Premier League table after dropping points for the first time since the second game of the season. Wilfried Zaha won Palace's late penalty after Raheem Sterling was adjudged to have fouled him, capping another outstanding performance by the Ivory Coast international, who has been linked with a January move away from Selhurst Park. But when asked if he will be staying at the club, Zaha said: "Yep, I am." Palace manager Roy Hodgson also has to contend with injuries ahead of his side's trip to Southampton with center-back Scott Dann suffering a knee injury, joining fellow defenders Mamadou Sakho and Joel Ward on the sidelines. "We've stretched our resources to the absolute limit," said Hodgson.